It was just what the travel-doctors ordered. Sweet and savory. Light yet fulfilling. Exactly what every home-cooked meal should be. I found a recipe for the chicken on the Ravenous Couple, so I’ll definitely add this to my list to try. The green beans had the usual sugar, fish sauce, salt and pepper with shrimps. Pretty simple preparation that can be used for any green vegetable, really. His family procreates like it’s no one’s business, so we’ve had a lot of baby showers to attend in the past few years. This weekend we went to a cousin’s shower for their first and Anh wanted to make a special fruit basket for them. By the way, not sure if I’ve explained all of the usual pronouns and such in the Vietnamese language. Perhaps two of the most important for every day language are Anh and Em. Anh – pronounced like ah-n – is used for elder men or the man in your life. So in my case, I call my husband Anh which would be like “honey”, “babe”, “sweetheart” or “sugar lips”, whatever you call your significant other 🙂 He calls me Em – pronounced like am – which is the term used for older sister, younger person in same generation or your female significant other. Make perfect sense? Yeah. So you’d call your girlfriend or wife Em, husband or boyfriend Anh. Anyways. So Anh has become a student of my Dad’s fruit and vegetable animal designs and wanted to make something for his cousin. 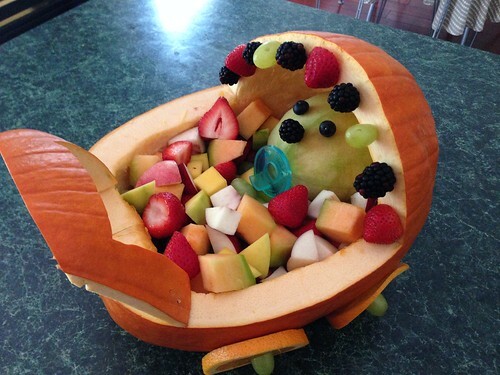 Behold the Pumpkin Baby Carriage Fruit Basket! 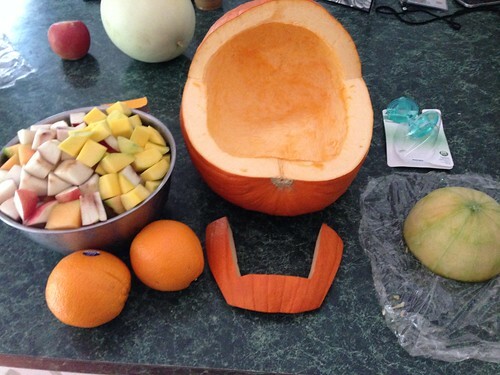 We wanted to make an actual baby so we halved a cantaloupe and picked up some binkys (which my nephew loves) that they can actually use with their little one. 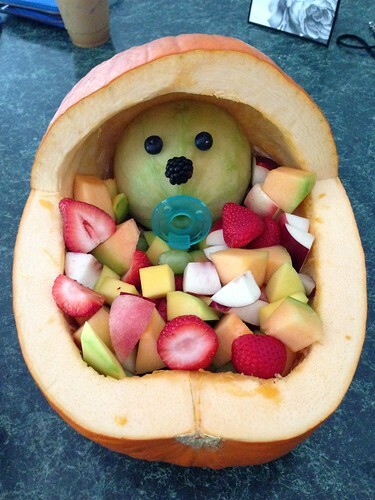 Is this not the cutest fruit baby you’ve ever seen? It was a huge hit at the shower, in case you were wondering. After we assembled the basket, we were starved and needed food that didn’t require any of our own effort. Enter Le Bledo. 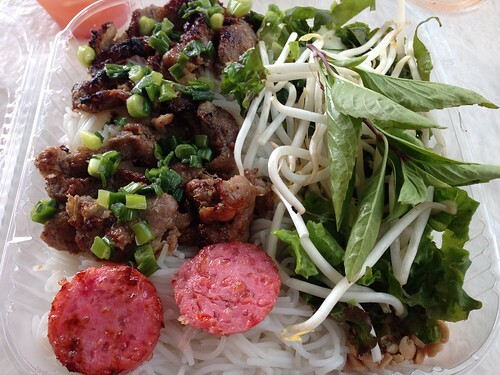 I didn’t feel like a soup and went for the always satisfying Bun Thit Nuong – grilled pork on vermicelli noodles. 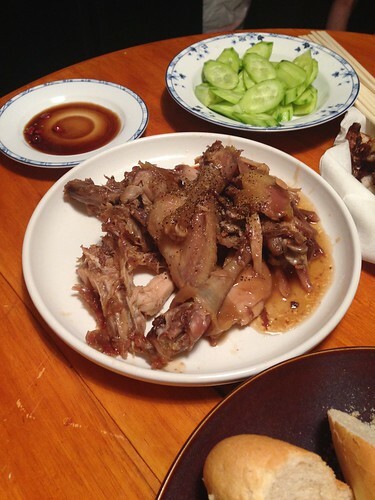 They serve theirs with a sour ham, which is like nem nuong but with vinegar, which I love. 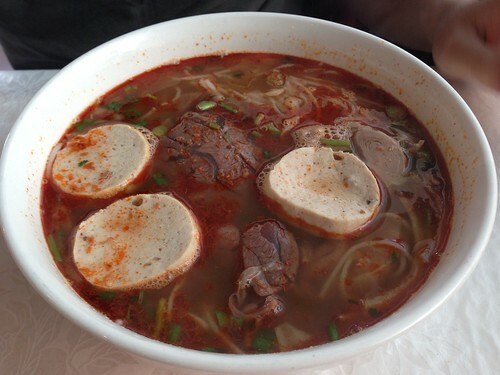 Anh was craving Bun Bo Hue soup which is a rich soup chock-full of beef, ham hock or knuckles, chả (pork patty/luncheon meat), cooked pork blood, herbs and noodles. 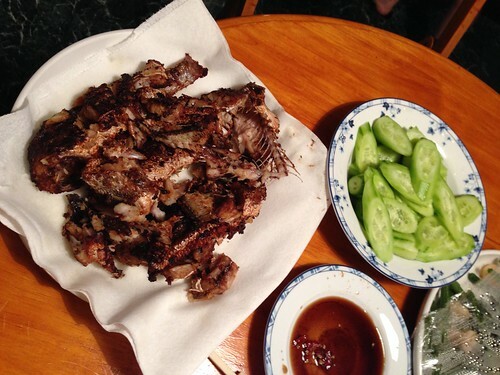 It is traditionally served with thicker noodles, but Anh likes the thin noodles. I think this will be the next soup I try to make at home. The broth is delicious – with lots of lemongrass, anatto, garlic, mam ruoc shrimp paste and other yummy goodness. You can eat whatever fillings you like, so if cooked pork blood isn’t your thing, no problemo. So yeah. Our first weekend home was busy, but thoroughly enjoyable. Lots of tasty food, crafts and fall goodness – couldn’t ask for anything more. Now I’ll get back to my pumpkin beer sampling (currently Dogfish Head Punkin Ale – delicious) and the Redskins.